Have you ever visited the church and heard of a church service where Christians drink grape juice or a small sip of wine along with a small piece of bread?If yes, you must be familiar with the term Communion. But if not, we are here to give you a brief intro about what exactly is Communion, and then we will move on with some smart ways to decorate with balloons for the first communion. Communion is a tradition followed by Christians from thousands of years where they eat a small of a piece of bread as a symbol of the body of their Lord Jesus, and wine is drunk as a symbol of their god’s blood. This is quite astonishing but true. It’s not just about eating a small piece of bread and drinking wine, but it is about representing the body of Jesus and his blood. According to Jesus, Communion is a celebration and Christians should celebrate it in the case they are aware of the real meaning of this occasions. Jesus gave way his life and was broken down so that people living there could live peacefully. 1. Create A Centerpiece Representing Jesus. This festival is celebrated as a symbol of Jesus body and his blood. What about an idea of creating a centerpiece of Jesus body or the cross that Christians believe in the most. You can use mixed combination of colors and decorate your center price in a way that no one has done before. These people are much interested in celebrating the Christmas party. 2. Create Balloons Pillars At The Entrance And Decorate Christians’ Cross Over It. 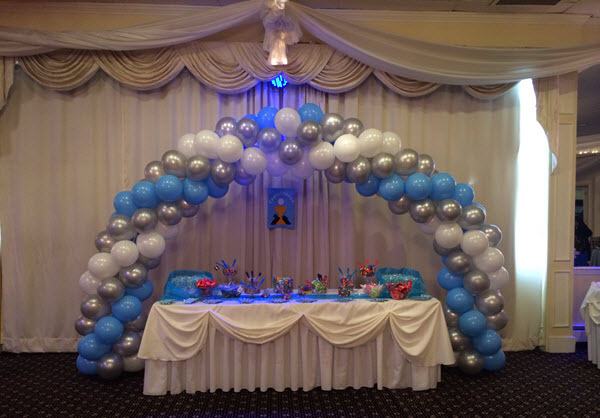 Use second color balloons and create colorful pillars to decorate the entrance of the party area in a unique way. 3. Inflate Colorful Balloons And Hang Them Over The Center Tables Of The Guest. Make sure you have the list of your party guests ready for you. Inflate colorful balloons and write the name of your guests over it. Surprise your guests with this fabulous decorative idea. 4. Decorate Communion Area With Glowing Balloons. You can use small glowing sticks and put them inside the balloons. Then inflate the balloons and see the magical effect that the glowing sticks give in your party area. 5. Plan To Give Return Gifts To Guests And Hang A Balloon Over The Gift. This is one of the best ideas to give excellent return gift to your guests. Create a list of gifts that you would be giving to your guests and hang colorful balloons over them. Above are some of the smart ways to decorate your first communion with balloons. Hopefully, you find these ideas creative and use them while decorating your day.